Agility is a unique and continuously evolving state that is typical to a specific organization. It is a state that corresponds to the combination of an organization’s people, set-up and history. 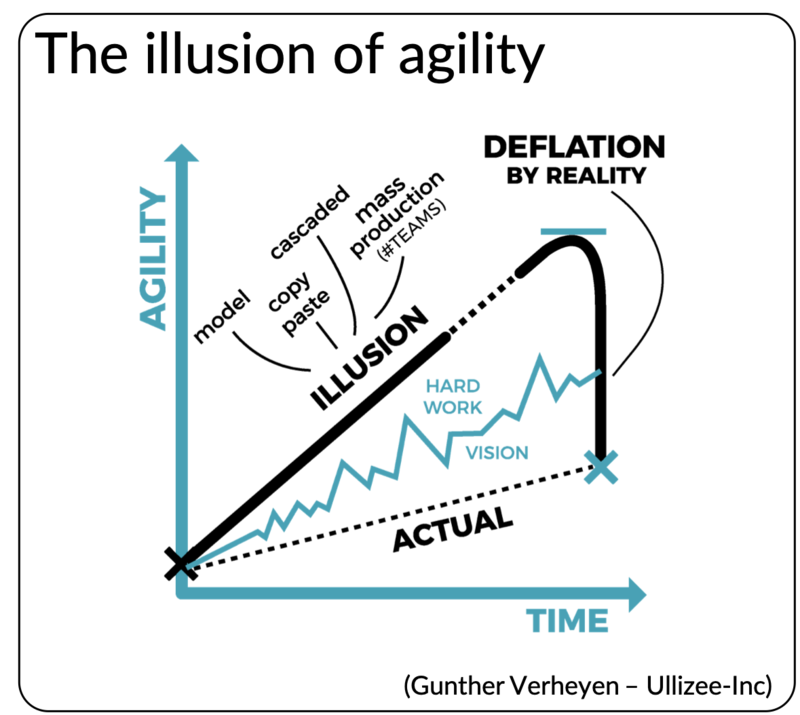 A traditional (industrial) approach to becoming more Agile commonly creates no more than an illusion of agility. Agility is a specific state as it reflects the unique lessons and learnings that an organization and its inhabitants went and go through. It reflects the way in which specific annoyances and hindrances were and are overcome, the many inspections and adaptations that occur along the journey. It is a state that prepares organizations for the unknown future challenges that will demand distinct responses. Agility is a unique signature with imprints of all people involved and their relationships and interactions, of used and abandoned tools, processes, and practices, of the constructs within and across the many eco-systems that make out an organization, potentially even stretching across the organization’s boundaries. However, many of our organizations have their roots, and their beliefs, in the past industrial age. As they feel the need and the pressure to increase their agility, they naturally revert to familiar, yet old-school, industrial recipes. They undertake cautiously planned attempts to gently shift to the Agile paradigm (although they need to leap) wrapped in separate change projects (although their organizations need re-integration). They look around and imitate what other organizations do. They copy-paste what others, regardless whether they operate in the same economical domain or not, claim brought them success. They enforce unified ways of working and practices in a cascaded and mass-production way. They rely on text-book models that prescribe generic pre-empted blueprints of organizational structures. The learnings and the hard work needed to acquire sustainable agility, tuned to the organization’s specific context, are conveniently ignored. Ironically, these are the exact approaches that block these organizations in their growth. These are the exact ways of working that they need to abandon in order to enter and survive the new worlds, the worlds that require a higher agility. The mismatch is fundamental. They need and want to hose down their industrial ways, yet they end up re-enforcing them. No more than an illusion of agility is created as a result. This is painfully revealed when the deflation by reality hits hard, often after several years. When the actual increase in agility turns out negligible, a painful finding certainly in the face of the urgency. The actual results turn out disappointing. The lost time is a catastrophe. Increasing agility is a path. Progressing on that path requires vision, belief, persistence and… hard work. 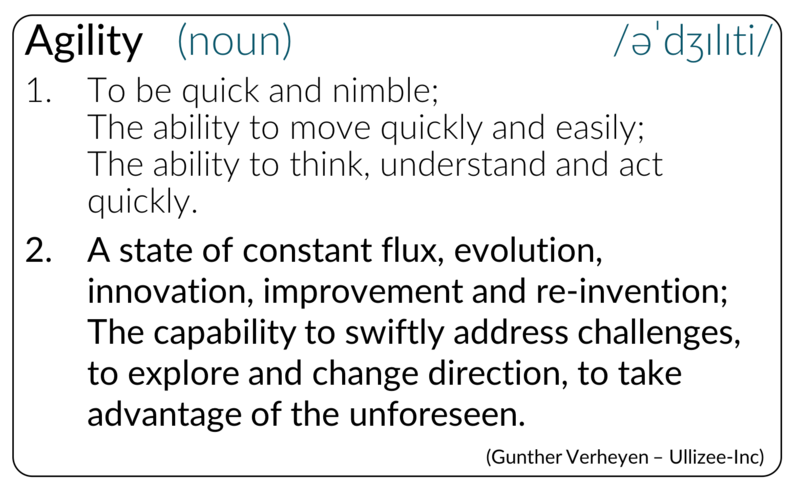 Agility, as a state of high adaptiveness, can only be achieved by regularly… adapting. Adaptations only make sense upon inspections of actual work and observable results. Think feedback loops (all around). The new reality, for which higher agility is needed, mandates that what works today might not work tomorrow. What works for one company (i.e. a complex system of interconnected people, processes and tools) might not work for another company. What works for one combination of teams, technology and business might not work for another combination. It is not an Agile transformation of Scrum if it doesn’t increase the actual collaboration of people (customers, teams, stakeholders). Note. None of the above makes sense if no proper attention is given to technical excellence. The new reality tells us we need to act in the moment more than we did before. Ever. Embracing uncertainty and unpredictability has a great potential too. Getting the most out of the possible thrives upon acceptance of the unwritten state of the future and what that future might bring. It reminds us that we are not alone in this, that each individual, no matter their function, level, position or silo, can contribute. Living the art of the possible against unpredicted outcomes has the potential benefit of engaging people as it shapes their future. Acceleration comes from vision, determination and dedication; from the courage to move away from following a plan or copying a model to continually shaping and re-shaping your future. Regardless an organization’s past attempts and choices, the path of hard work is always a workable way out, a way to break the illusion of agility.